Now that winter has come to much of Europe, it got us thinking about high-lattitude urbanism. We’re used to seeing renderings for urban development projects filled with sunshine and fair weather, but what about long stretches of darkness, freezing temperatures, and howling winds? How does permafrost change the equation? 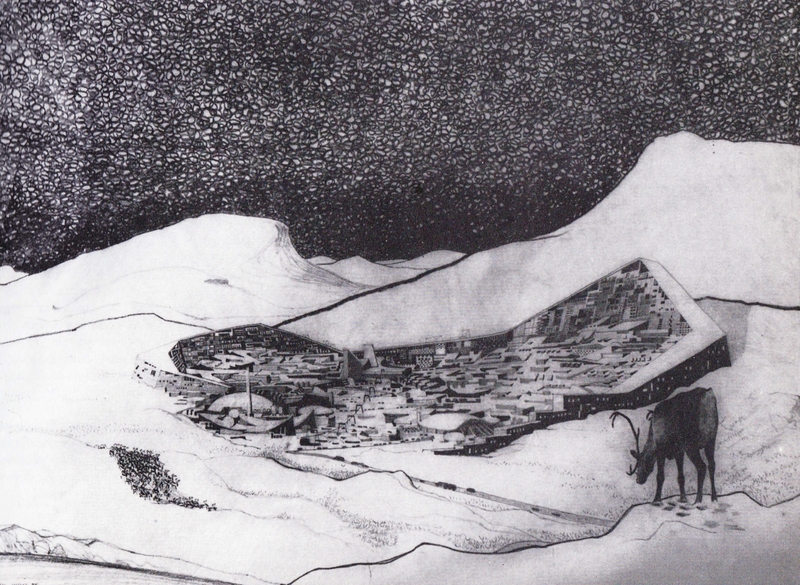 Presented below are three articles from cyberspace that explore the frosty side of urbanism. We hope you enjoy them while sipping a hot beverage or sitting beside a roaring fire. Canada’s North is home to the fastest-growing population in the country, with more than 115,000 people living in small, dispersed, and isolated communities. But to the architects who attempted to forge a new kind of Arctic urbanism there 50 years ago, it appeared breathtakingly vast and empty. At the time, the region—comprising Yukon, Northwest Territories, and Nunavut—was something of a hotbed of modern urban planning. Practitioners devised ambitious urban works for governments and private corporations that used modernization not as a cultural project, but as a tool to bring aboriginal people into the “modern world” and compel them to embrace southern practices. The new town of Inuvik in the Northwest Territories was emblematic of this push, intended by bureaucrats in Ottawa as a showcase of modern development in the region when it was settled in 1954. The declaration on Inuvik’s dedication plaque celebrates its mission as “the first community north of the Arctic Circle built to provide the normal facilities of a Canadian town.” The focus was implicitly on the delivery of services, not architecture or urban form. The state required basic accounting—the construction of so many schools or hospital beds or housing units—rather than addressing questions of the quality of design, especially in the early days of northern nation-building. Leena Cho double-checks the zipper on her poppy-red jacket as the boat makes headway. She grins at the students; they are all jet lagged but facing icy winds with palpable excitement. Cho is intense, with a seriousness she often undercuts with a wicked dark humor. 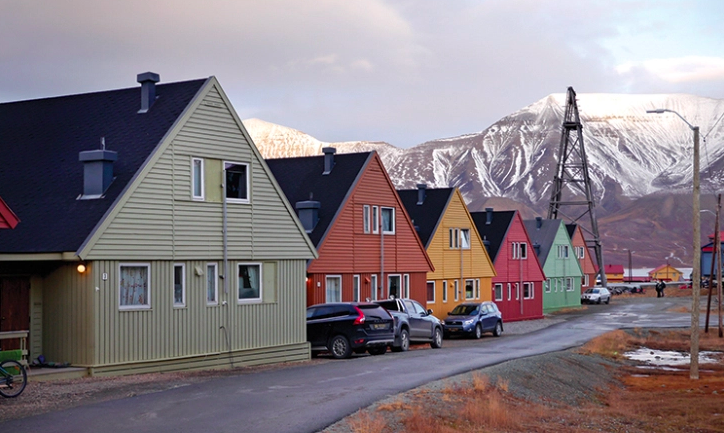 Along with her husband, the architect Matthew Jull, she founded the Arctic Design Group (ADG) in 2013, to examine how landscape architecture and architecture can contribute to places like Svalbard or settlements in the Russian and Canadian Arctic. Cho is an assistant professor of landscape architecture at the University of Virginia (UVA), where Jull is an assistant professor of architecture. Cho is American, born in Korea. Jull is Canadian and, besides being an architect, holds a PhD from Cambridge in geophysics. Jull is contemplative and direct, with a focus on working; throughout the Svalbard trip he was often the first up and last to bed, his stamina exceeding that of students some 20 years younger. Both Cho and Jull are fond of heavy metal, and their garage in Charlottesville, Virginia, is home to a classic 1980s Mercedes and Jull’s beloved vintage BMW motorcycle. ADG has been the vehicle for Cho and Jull’s north-focused work over the past four years. They have organized symposiums that brought together scientists, anthropologists, and designers to discuss Arctic settlement. As professors at UVA they have published papers and led studios and seminars, all with a focus on the Arctic. They have been researching and visiting the Arctic for about a decade, starting with a 2008 trip to Barrow, Alaska. Some of their work is comparative, looking at various Arctic settlement models. All of it considers the role and value of design in environments where construction is often led only by engineering. Arctic settlement is circumscribed by climate, motivated and mediated by the deep pragmatism of economic and political forces. It plays out in a centuries-old struggle for resources on the scale of the individual and the nation. Extreme circumstances north of the Arctic Circle mean that towns were and still are established only for extraordinary reasons. Towns are rarely accidental; above the 66th parallel, they never are. I recently returned from a week in Reykjavík, Iceland, working with staff of the regional association of municipalities on the frame of a future public transport plan. It was an opportunity to meet with key elected leaders – including Reykjavík Mayor Dagur Eggertsson and public transit authority chair Bryndís Haraldsdóttir – for a conversation about what they want public transit to be, and what choices might follow from those goals. I also ran a two-day workshop for municipal and national transport staffs, to help them explore their options for their transit future. Greater Reykjavík is dramatic urban landscape, all perched on ridges or gathered around fjords. As in any European city, there’s a walkable historic core, attractive to tourists but still intensively lived-in by the locals, and with plenty of cranes on the edges signaling even greater density in the future. Iceland’s most interesting challenge is that it’s a small country at a time when we’re all supposed to worship bigness, so it probably takes some effort for Icelanders to stay focused on solutions that suit their scale. Iceland’s population is only about 330,000, of which 2/3 are in greater Reykjavik. If it were in the EU, Iceland would be the smallest member by population, smaller than Malta and certainly smaller than giant Luxembourg. What’s more, Iceland’s population is small for good reasons, mostly limitations of land, sunlight, and climate. For most of Icelandic history, fish has been the only abundant food resource, but today even that is in need of management. Agriculture so close to the Arctic Circle will always face limits even if much of the soil hadn’t washed away — the result of medieval Norse colonists cutting the ancient birch forests faster than they could regenerate. Today, Iceland is a world leader in the sustainable management and restoration of natural resources, but in such a remote and challenging location there’s not much point in growing beyond what the bare land and low-angle sunlight can support.